Direct the tendrils of your favorite plants upward as they grow with these Gardeneer Soft Plant Ties. Using a support around your young or delicate plants encourages them to grow upright, and fosters a strong root system. The unique, rubberized coating on each of these 15' long cords prevents bark damage, and is ideal for securing fragile vines. The green color of the ties meshes with foliage, and the wire center in each unit adds sturdiness to them. This also ensures flexibility, and the items may be cut with garden snips for a wealth of different limb sizes. Maintain your garden with help from these Soft Plant Ties. 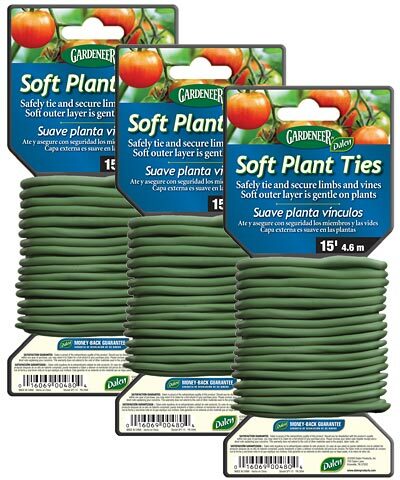 Note: This case pack includes 3 of the Gardeneer Soft Plant Ties, 15'.